The face of consumption has greatly changed for the past couple of years. Now, with the help of rapid technological advancements, people have flocked to the conveniences offered by the digital world. For businesses, this translates to being able to adapt to the changing needs of the people. 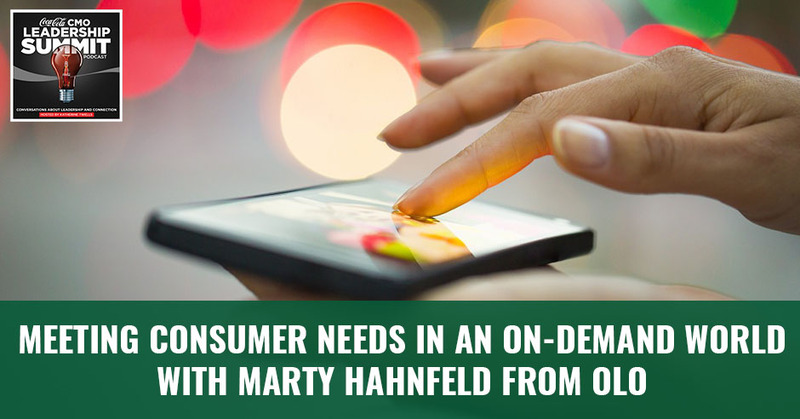 Focusing on the huge shift happening in restaurant retail is Marty Hahnfeld from Olo. 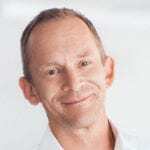 He provides front-row information about how consumer needs have changed in an on-demand world and what are some of the effective ways to meet them. Highlighting the role of the digital world, he talks about the delivery system and its impact on consumers’ psychology as well as third party marketplaces. You’ll find his inputs very helpful, most especially if you’re trying to move your restaurant business forward. 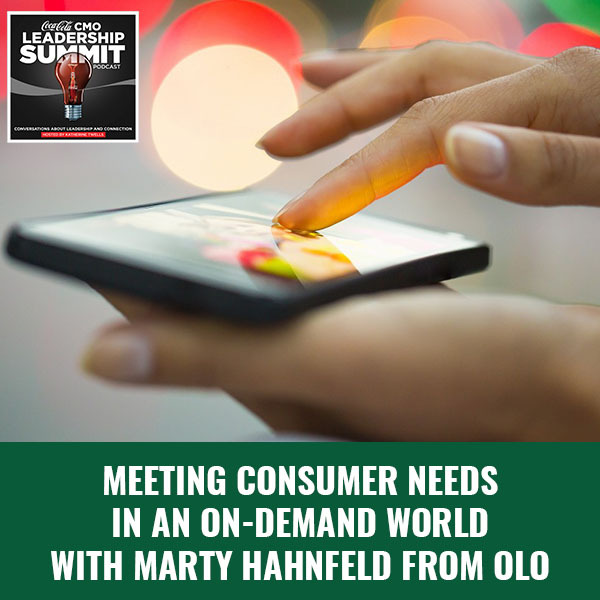 This is Marty Hahnfeld’s talk titled Meeting Consumer Needs In An On-Demand World from the 2018 Coca-Cola CMO Summit. I want to draw your attention to the Chick’n Shack. There’s a Shake Shack’s chicken sandwich and it’s a great representation of what every restaurant brand, whether they know it or not, is up against. It’s a delicious sandwich. It’s from a brand that people like. It’s beautifully presented both in the store and from my perspective digitally. It’s also available to consumers, however they want it. You can go into the store and you can deal with a human. You can go into the store in most cases and order from a kiosk and skip the human. You can eat in, you can take it out. You can order it from the Shack app. You can order it from aggregators. You can pick it up and have it delivered. You may make a better chicken sandwich as a restaurant brand, but I’m not sure that you don’t keep up with the presentation and the conveniences that are available that it’ll matter. If I’m hungry for a chicken sandwich and this shows up and presents itself, I’m probably going to buy it. It’s probably going to be pretty good, even if it’s not the best chicken sandwich. Next time, if I had a great experience and I’m going to go back and I’m going to get it the way I want it next time. As we go through nowadays and what’s happening in digital ordering and delivery, keep this as a frame of reference as a bit of a benchmark for what everybody at the top of the class is doing. First a bit about Olo, for those who don’t know us, we’re a software company based out of Manhattan. The company was founded in 2005 and was one of the original pioneers in mobile ordering. It’s got this terribly clichéd entrepreneurial story associated with it. Our Founder and CEO, Noah Glass, punted his Harvard Business School admission in order to start the company. 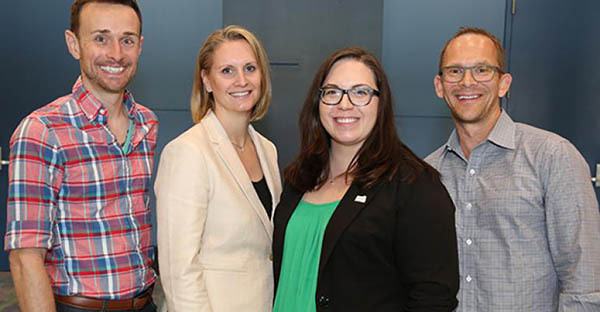 He was standing in line for coffee one day and felt I like, “I should be able to skip the line and order.” Several years later, that caught some tailwind. Now, we power the digital ordering programs for the majority of public restaurant brands and all in all about 250 brands and 50,000 locations. What that means is Olo itself sits behind the scenes. We’re not a consumer brand. We do everything wrapped in our customers’ identity. I could list them off with half of the public restaurant brands as clients. You can go to the Portillo’s app or the Denny’s app or the Five Guys app or the Shake Shack app and it’s Olo behind the scenes. We’re processing the orders, presenting you the menu, coordinating the preparation of that food so it’s handed off with as little error as possible. I’m going to talk about maybe a little bit more tactical perspective on what’s happening in our marketplace from our perspective. The interesting thing about Olo is we get a front row seat to everything happening, but we get the benefit of having more data than most people. We get to see all of this happening in aggregation and we can step back from it and say, “It seems things are doing X,” and then we can look at an aggregate view of 250 restaurant brands and we can say, “X is happening.” The driving thesis behind Olo and what we believe is the fundamental truth. A couple of years ago, our presentation was completely based around this story is that a huge shift is happening within restaurant retail. That is over the next few years, 25% of what is transacted in the restaurant now will move to digital. In an $800 billion annual business that means $200 billion is going to go online. If you think about that in an industry that is flat or growing or shrinking marginally from quarter to quarter, what that means is that shift is going to happen intra-industry. There will be winners and losers and it’s a zero-sum game for most people playing. The bottom line there is pretty quick to get to. If you’re a restaurant brand, you will need to be great at digital and eCommerce. Otherwise, some big chunk of your opportunity will go to somebody else. Sweetgreen has one of their newest stores in Bryant Park. Sweetgreen has been a customer of ours for a few years. They currently do over 50% of their total top line revenue digitally through their apps and sites. 100% pickup, they aren’t even doing deliver yet. It’s only going to go up from there. The interesting thing about this Sweetgreen store is that even the physical layout of their stores has been completely changed by digital. Admittedly, they’re a little extreme but it’s a salad brand. There’s nothing saying that any restaurant concept, any service model or any food type couldn’t drive toward a future like this. When you walk into this Sweetgreen, three walls of the restaurant are shelving. In this one location, it’s not uncommon for us to do over 1,000 orders a day that originates on the mobile app. The alternative is to go into the restaurant, queue up and go through this Chipotle-like build my salad experience. It’s pretty clear that the majority of people elect to place the order ahead. The second time was even better than the first time. It’s a repeat order, a saved favorite or the saved payment credential. The friction is super low. They’ve re-staffed and reoriented how they service their customers. If you walk into the digital side of the location, you’re greeted. You’re asked for your name. Maybe even a little small talk and they hand it off. This is the frame of reference in which we’re thinking about our business. A huge shift happening and then within the last couple of years of this thesis, delivery has shown up. This is an otherwise unremarkable weekday in New York at the window of our CEO’s apartment. Don’t get me started. He is constantly photo journaling his way through, “Here’s a scene of the on-demand economy.” There’s something telling about this. It’s literally a bird’s eye view into an intersection. There are three delivery couriers on bikes at this one moment in time. Two of them are clearly food, one’s probably Amazon. What it’s reflective of is that the on-demand economy, the arrival of rapid ordering, delivery and consumption within a compact period of time is something that consumers very much want. It’s exploding. It will drive that $200 billion shift. It will accelerate it. It may even raise the cap of that. One of the fascinating parts is consumers value this convenience so much that they’re changing their expectations of what they’re willing to give up in exchange for these conveniences. We’ve done this for a while. We’ve talked about how soggy fries are okay when it comes to delivery and we’re convinced that this is the case. Consumers rate delivery and the quality of the food higher than the drive-thru and other pickup mechanisms at Portillo’s. That’s because people are pumped to have this bag handed off to them at their front door that they can dive into. That experience is satisfying to them that they’re willing to make that trade-off and that it leads to an elevated consumer experience. The other thing we know from the dollars and cents perspective is the addition of delivery to a brand’s digital eCommerce program immediately adds 20%. There are other things about delivery that are interesting. When delivery is available, all eCommerce orders convert at a higher rate. Delivery orders convert at a higher rate. People build up a basket and if delivery’s available, they’re more likely to complete that purchase. Depending on who you talk to and how the conversation is framed up, it’s pretty safe to summarize that this is business you will otherwise not get. In other words, the consumer’s consideration set for that order is driven primarily by the convenience of getting it delivered to them. If you’re not delivering nowadays, hopefully it’s not based on some old school thinking of, “I don’t want my fries to be cold.” It’s okay. The opportunity to go secure business that will otherwise not walk through your door is important. There’s another thing that’s happening and that is delivery and the third party marketplaces that have also come onto the scene at the same time. I’m talking about Grubhub and DoorDash and UberEATS and Postmates and list goes on and on. They’ve confused the industry with regard to what it is they are and how you should be thinking of them. The term, “The delivery providers,” is an interesting one and we think that’s a dangerous way to think about them and refer to them. They are independent, separate marketing channels, indirect marketing channels that are expensive. They happen to use delivery as a consumer acquisition method. In this frenzied time where delivery’s coming on the scene, brands are feeling the pressure to put delivery in place. They’re seeing things like McDonald’s wrapping their buildings in, “McDelivery is now available on UberEATS. Yum! and Grubhub all in together. We’re going to put $200 million to work and we’re going to make delivery available everywhere.” There’s an assumption that any brand can do what McDonald’s has done and what Yum! has done in that it’s the same. We would argue it’s not. Consumer Needs: Consumers value convenience so much that they’re now changing their expectations of what they’re willing to give up in exchange. Third-party marketplaces are not delivery enablement. Third-party marketplaces are indirect marketing channels that can bring you incremental consumers that you might not otherwise be able to get. The distinction of those is important. Adding a deal with Grubhub and saying you now have a delivery strategy is insanity. They are not your delivery solution. I can’t necessarily tell you what your best delivery solution is. For some brands who can do high volume, it may even go so far as adding your own couriers. It’s not a popular topic in the restaurant industry. I would say for most it doesn’t fit, but there is a range of tools available to enable delivery and keep your consumer directly engaged with your brand. The marketplace is no more than anyone that consumers want delivery. They’re coming to you. They’re coming to restaurant brands and they’re offering you a little taste. They’re saying like, “Let’s run a promotion. This is Smashburger on DoorDash. Try me free for the week. $0 delivery fee.” They put it right up front on the header. We’ve had many of our customers participate in these promotions. It’s an overnight 5X spike in volume. This works. Put a big headline up. You offer $0 delivery. People take advantage of it. For a restaurant operator or franchisee, that feels pretty good. It made me think of other industries where the taste for free is super effective like that. I could think of one and that is, “Here, try it a little bit. Go with it for a week.” If you put yourself in the shoes of the franchisee who kicks things off that way, they immediately reap that cashflow, not concerned about the bottom line. It starts off this cycle of becoming co-dependent. I’d like to switch gears and give you a backstory. If there’s a solid takeaway from our time together now, the thing I would like to draw your attention to and encourage you to do is to go study up on what happened to the hotel industry. What’s happening to the restaurant industry now happened many years ago to the hotel industry, almost identically. There are slight differences between a hamburger and a hotel room. For the most part, what’s playing out in the eCommerce space on the restaurants has played out before in the hotel industry. What happened was that put the hotels into a bit of a lulled state. The revenue was coming in from the marketplaces out of 15% to 30% commission. One day, the hotels woke up and realized that a quarter of their hotel rooms were being booked through these channels at a high tax. They’re not surplus hotel rooms anymore. The consumers who booked once are going back and we all do it. We all use Expedia and Orbitz and all these others because, “They’ve got my credit card. I log in. I select my room. It doesn’t matter what brand. It books through. It’s easy. Done.” The same thing’s happening in the restaurant space and we went and studied this. It’s fascinating from so many perspectives, mostly in that through all this landscape of time the hotels have never figured out how to solve the problem. What we have now are marketplaces that book 70% of all digitally booked hotel rooms come in from an indirect commission channel. That’s a third of all hotel rooms. I went and talked to software companies and people in the hotel, the hospitality industry and rubbing my hands like, “What did they do?” Some ran lowest price guarantee, stop clicking around and big campaigns to draw consumers back. The truth is we’re all creatures of habit. If we start using an eCommerce experience that is a good eCommerce experience, and we then associated with that brand like, “When I book Hilton, I go to Expedia because that’s how I get it.” It’s hard to get that consumer back. There are a set and a growing set of those consumers. To the extent, that’s interesting and if you can make the economics work, then go for it. Don’t give your consumers away to that general. The consumer that comes looking for your brand at the top of the funnel, you have to capture that consumer. A few things about indirect sales to keep in mind and you’ll learn this if you go spend time and look at the hotel industry. Aside from the perilously low margins for your operators, most people would conclude that in an otherwise busy window, you can take the haircut on the margin and it’s worth doing that business. If you’re diverting one of your customers, going back to if we see a website where the consumer arrives at the website. If I go to whatever brand directly and that brand is directing me away from my direct property to a marketplace, that’s straight up lunacy. You have given that customer away forever regardless of what your commission rate is now and maybe you think you negotiated low commission rate. The marketplaces are in the business of maximizing their yield, getting the highest price, highest commission for any given order. They are going to take that consumer and then eventually they will convert that consumer. The real perilous part is that because of the expanded catalog that a marketplace has as opposed to the brand direct, they will always be able to pay more to acquire the next consumer. In the hotel industry, the reason you see the marketplaces or the OTAs at the top of the Google results from an AdWords perspective is that they’re straight up willing to pay more for a click than the brand direct. Even though I may go looking for Hilton, I may see, “Starwood’s on sale this week. I’ll book there. They can convert them better.” We’ve come to the conclusion that there’s an element of a brand’s digital IQ that goes directly to digital sales. We know that there are market analysts who are following along with this. They’re starting to pressure brands that they cover to report on not only the percentage of digital but a breakdown of those digital sales. How much of that are consumers coming directly and purchasing on brand versus consumers purchasing from the band via a third-party? There is a better way. There are tools from companies like Olo. We help brands with digital enablement. Digitally enabling delivery, keeping a consumer on brand, keeping you as the merchant of record and helping you own that all the way through to completion. While leveraging third-party delivery resources, not hefting to build a fleet. Consumer Needs: If we start using an ecommerce experience that is good, we then associate with that brand. These are results from a trial that Wingstop did in Vegas. The light blue line was their eCommerce pickup business and they shared this in their Q1 financials or investor update. They’ve since rolled out other cities with similar results now. They’re early days of rolling delivery out. What we found here that was interesting is this is a brand that is doing nationally about a quarter of their business via direct eCommerce. Olo powers the Wingstop app and site. A quarter of their total business comes in through that channel. It’s traditionally been all pickup. What happens when they layered delivery in, the dark blue cohort and results are deliveries that originated and stayed on Wingstop.com or the Wingstop app. Those were enabled via Olo’s Dispatch platform. At the same time, they added a single marketplace in the same market. What we saw here is that there’s excellent brand advocacy. There’s brand loyalty. The consumer went looking for Wingstop. They discovered that delivery was available. They took advantage of that, but they stayed on brand 4:1 over going to the marketplace. We think that this opportunity exists for every restaurant brand. To take and capture your most loyal consumers with a gravy commerce experience. Whether it’s direct for pickup, drive-thru or whatever handoff mechanisms you have available but also adding delivery without sending that consumer away and abandoning the direct 1:1 relationship with that consumer. To the point of many of the presentations I heard here, this accelerates from here. Everything doubles again in 2019. We are watching same-store sales on the Olo platform. These are stores that were live on our program from year-to-date 2017 through the year-to-date 2018. Same-store sales blended across all of them, 56% up in an industry that’s flat. It illustrates the shift. That rate of change, that rate of growth is accelerating. At the beginning of the year, it was 30% something. It takes Uber a few years to hit critical mass and then it flips a switch and then everybody hot piles on. It feels we’re approaching that in food ordering. The rate of same-store sales growth is accelerating. Every brand has to have a digital strategy, a digital commerce strategy. It needs to offer the most loyal consumers to that brand a direct approach to preserve that direct relationship with the customer. Not advocating not working with the marketplaces, they do have what they say they have. They have a loyal cohort of users that are loyal to their marketplace specifically. They can bring you those consumers albeit at a price. One of our customers ran this fascinating, methodical test over our platform. We integrate the third-party marketplaces into the point of sale for a lot of our customers where they added a third-party marketplace and then they replaced it the following month with another. They then added the first one back on. They wanted to understand what the cannibalization and the cross-pollination was. They’re completely incremental to one another. We didn’t see consumers leave the one marketplace and go to the other because the food was available somewhere else. When you pile them on, it was one plus one. If you don’t have those things, you’re in trouble. If that does sound a little dramatic, I’m going to ask you all a question of whether you have an investment opportunity for you. This is a snapshot of our Slack channel, our internal sales and marketing Slack channel where we keep the SportsCenter ticker going of conversations and things that we have happening in sales and marketing. One of our salespeople caught up with the VP of IT, the brand is still not ready to discuss digital ordering or delivery. It’s a multi-hundred-unit restaurant brand and they sell chicken sandwiches amongst other things on their menu. It’s too late. The pressure that will be on a brand like this to catch up will be immense. As sophistication in the Sweetgreens of the world and other brands like it, rise, that $200 billion shift will become a difficult situation for the brands that are still crossing their arms and like the hotel industry hoping it will go away. 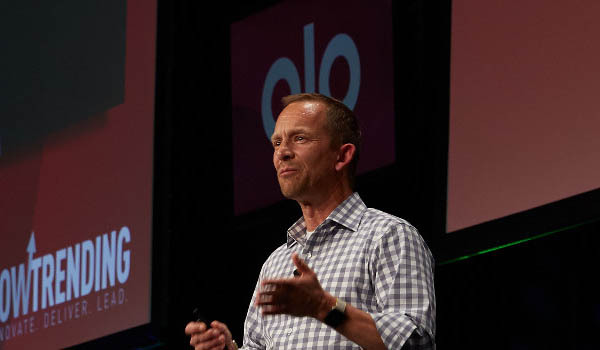 I lead the awesome Sales, Marketing, and Customer Success team at Olo, the leading provider of digital ordering and delivery solutions to the restaurant industry. Today, over 100 million consumers use the Olo platform to Skip the Line® or get food delivered from more than 250 restaurant brands they love. Through beautiful, fully branded digital interfaces, Olo’s enterprise-grade platform opens new revenue streams and integrates perfectly with the technology and operations already in place.